WE MAKE PARTS. WE FORGE RELATIONSHIPS. PC Forge, located near the shores of Lake Erie in Port Colborne, Ontario is focused on providing custom forgings to exacting specifications for customers who often have complex needs. We’ve created excellent relationships with our customers worldwide by meeting and exceeding their needs. Custom forgings serving: Defence, Lifting, Mining, Oil & Gas, Truck & Trailer. In-house forging design and engineering (including Modeling and Simulation). 5 Double-acting Power Hammers (rated from 2,000 to 8,000 lbs.) with gas heating. A 5000 lb. 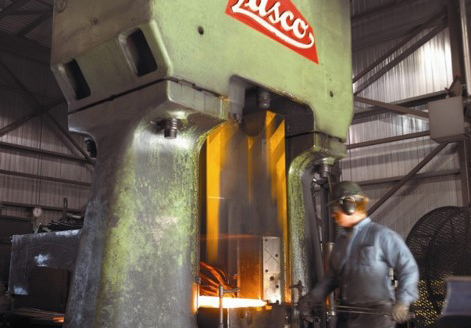 rated Lasco Hydraulic Hammer with Induction Heating designed for high production capability and precise forging tolerances. 3 Upsetters (4 inch, 6 inch, 9 inch rating). Flexible run sizes of 5 to 1000+ pieces. Weight from 1 to 300 pounds. Length up to 50 inches. Range of materials (aluminum, carbon, alloy, stainless, and nickel based steels).